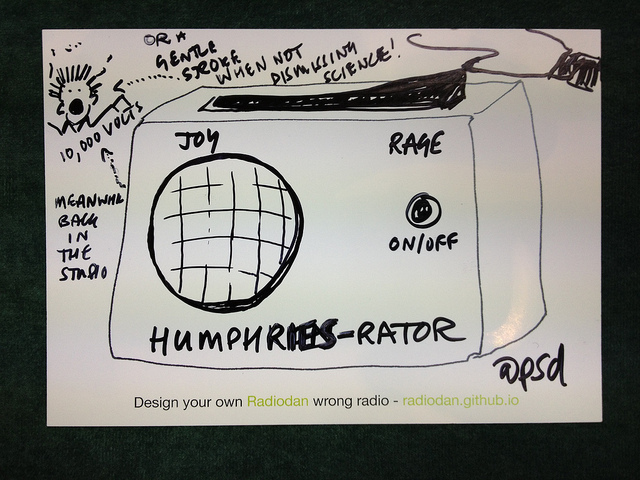 Radiodan is an Open Source (software and hardware) internet radio platform based around a Raspberry Pi. It was made in BBC Research and Development in the “Device Futures” Team. Dan Nuttall, Andrew Nicolaou and I worked on Radiodan with help from other colleagues, particularly Joanne Moore, Andrew Wood, Chris Needham, and Tim Broom. Andrew and Dan are leaving the BBC at the end of this week, so now seems like an excellent time to reflect on what it was for and how it was useful. Our work on Radiodan over the last two years was a two-pronged approach to understanding possible futures for radio. One prong was structured conversations with people about what they wanted from radio. The other was a prototype-led investigation into how to make a radio: what the architecture would look like, how it might be controlled, whether it would work, and how much it would cost to make. By talking to people about what they wanted, we expanded our own frame of reference about what a radio might be. By grounding the work in physical prototypes we gained a deep understanding of how new radio-like devices might be made. By showing other people those prototypes, we expanded their frame of reference too. “Expanding the Overton window for Radios” is an analogy too far, probably, but here goes anyway. When you explain the Archers Avoider, ask people to think about physical radios, and give them this set of simple tools, they say “oh!”, and then they say “my radio would do this: ….” and tell you. We soon had dozens of them. This is a kind of shuffled, messy product-space, a bunch of different features and ideas with no structure and no systematic way of exploring it. There are lots of potential features of radio that people would enjoy that don’t exist. There’s also a genuine, interesting, argument about accessibility here. If you don’t ask a wide range of people what they want from a device, you probably won’t be able to guess what it is they want or need. The postcards surprised us. We were getting slivers of light into bits of the product space for radio that we hadn’t considered. Radiodan is a little like the Jeremy Corbyn of radio devices. We were using mechanisms to try and expand the acceptable range of what constituted a radio by peering into a messy product space and then translating what we saw into prototypes. I’ll write about the prototypes we made in part 2. Thanks to many people for reading drafts of these posts: Damian Steer, Dan Brickley, Richard Sewell, Dan Nuttall, Andrew Nicolaou, Tristan Ferne. All errors and poor analogies are mine. This entry was posted in Uncategorized on September 9, 2015 by libbymiller.